Stitch Story: Kicking Off Crochetville's 2014 Blog Tour: Make Your Own Crochet Wrapping Paper! 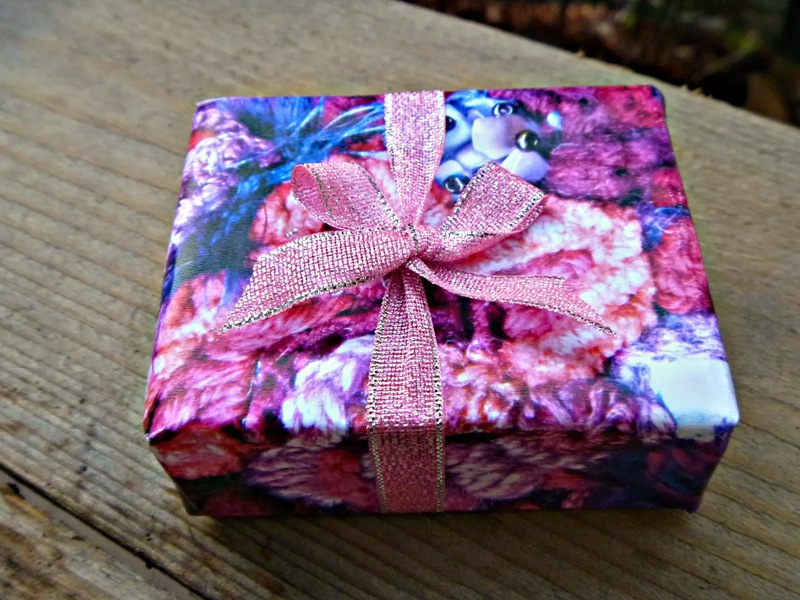 Kicking Off Crochetville's 2014 Blog Tour: Make Your Own Crochet Wrapping Paper! Welcome to Crochetville's 2014 Blog Tour for National Crochet Month! I am so excited to be a part of the tour, and I am really looking forward to seeing what the other designers post on their blogs. Everyone is preparing a special post for this month, and it is a great time to catch up with your favorite designers, and also find new blogs to follow! Crochetville chose Halos of Hope this year as our charity to promote. If you aren't familiar with this wonderful organization, they accept donations of crocheted, knitted, and sewn hats, that they distribute to 450 cancer treatment centers in the US each month. If you are interested in donating hats or money to help get the hats distributed, please visit their website. I am always looking for other ways to use my crochet, especially when I do freeform crochet. When you invest so much time crocheting something, it is nice to find other ways to use it. I think that making wrapping paper from your crochet is an excellent way to get more mileage out of your hard work. It makes the gift extra special as well! We recently bought a laser color printer, and when I saw the quality of the printed images, I knew I had to try this! I needed some gift wrap for a small box, so it was easy to print a piece large enough. 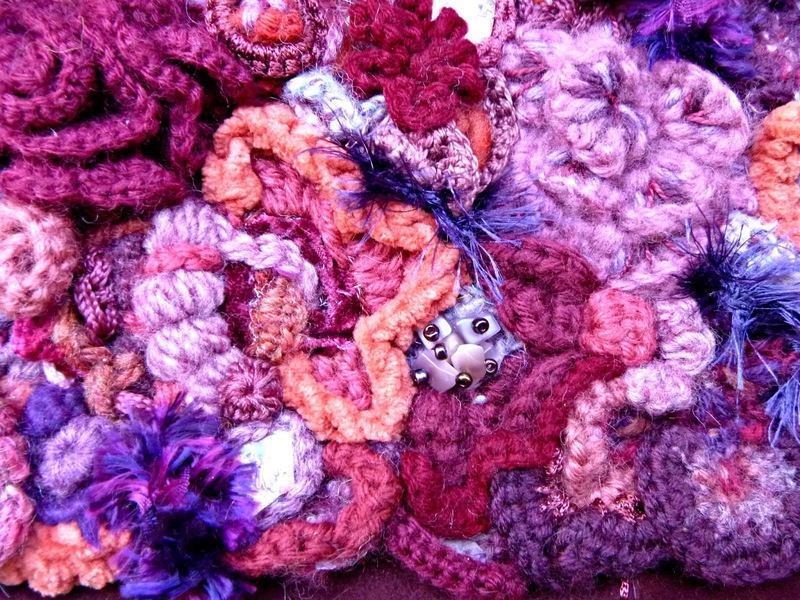 I decided to take photos of a freeform crochet purse that I made a few years ago. It happened to coordinate nicely with some ribbon I had on hand. I took photos of different sections of the purse and downloaded them to my computer. I chose the one that I thought had the best composition and balance of colors. Then, I simply printed it out, and cut the piece to fit the gift! 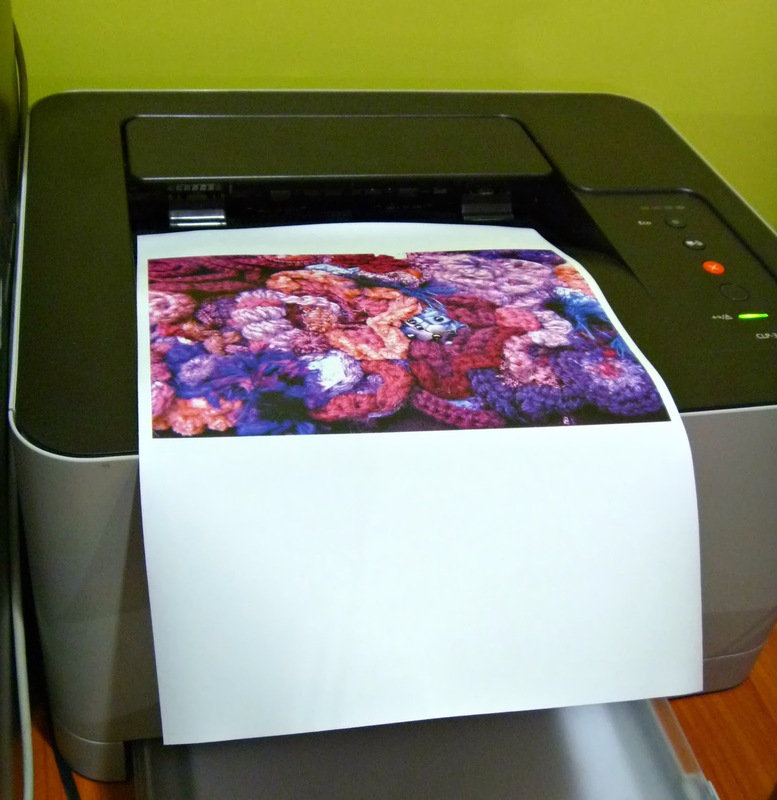 You could also use an inkjet printer, but the printout won't be glossy like commercially purchased wrapping paper. It will still be beautiful though! I will be using this technique for making greeting cards and small book covers as well. The possibilities are endless! Also posting on the tour today is Marie Segares, aka the Underground Crafter. 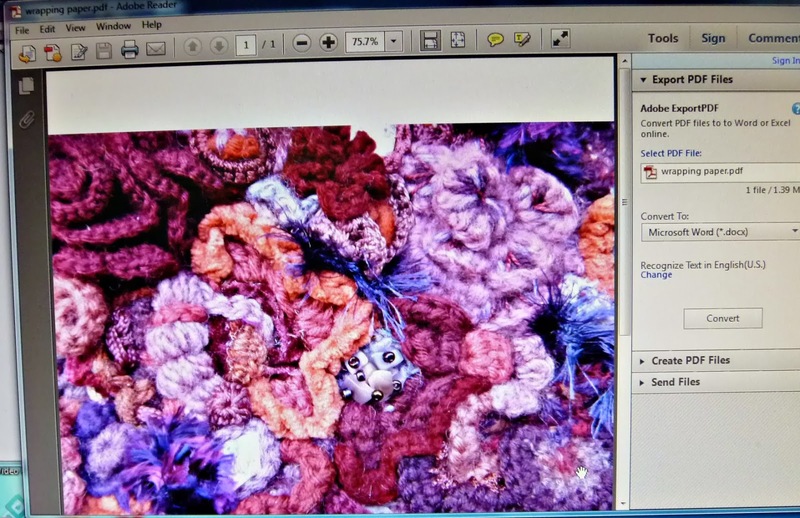 She is giving away a free pattern for a beautiful square motif. She has a great blog, so please be sure to visit it today! Be sure to visit Ellen Gormley's wonderful blog tomorrow (March 2), as it is the next stop on the tour. Ellen and I just co-authored a book together, "Crocheting Clothes Kids Love", so I think it is fitting that we are "neighbors" on this blog tour. She will be giving away yarn! Enough to make the set of boy's and girl's mittens she designed for our book. Enter to win before March 14th! What a great idea, Shelby. Thanks for sharing! Beautiful, and what a great way to get more out of all you hard work! Thanks for sharing. Great idea! Not just decorative and unique but a fantastic way to "show off" your creative work! I love this! Berroco Book and Yarn Giveaway!